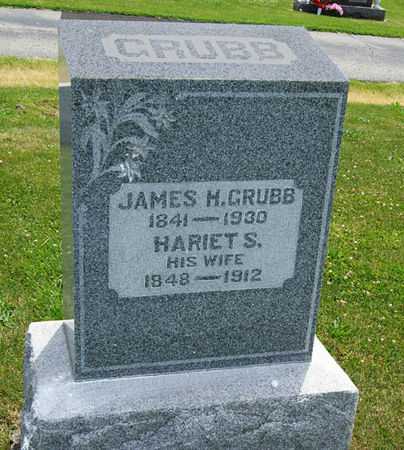 James H. Grubb, son of Adam Grubb and Elizabeth Mercer, was born Dec. 8, 1841 in Jefferson Co., Virginia and died July 7, 1930 in Lincoln, Lancaster Co., Nebraska. During the Civil War, he enlisted as a Private in Co. G, 9th Indiana Infantry Regiment, Aug. 27, 1861, being mustered out Sept. 28, 1865. He married Harriet Snider or Snyder Oct. 18, 1866 in Jasper Co., Indiana. She was born Mar. 18, 1848 in Bartholomew Co., Indiana, daughter of Peter and Catherine Snyder, and died May 14, 1912 in Bedford, Taylor Co., Iowa. Searching for JAMES H. GRUBB in Taylor County Iowa?